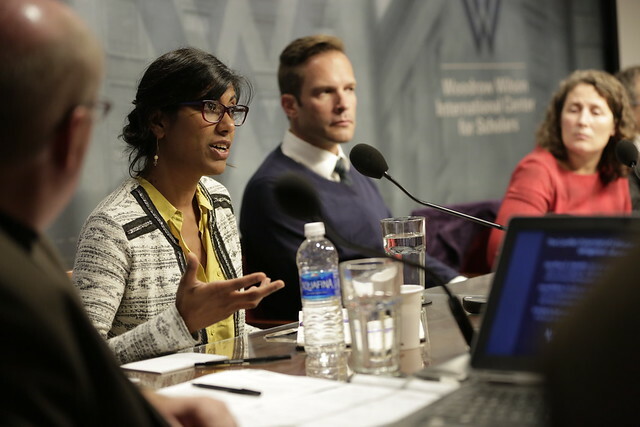 At a recent Wilson Center event updating research on the unintended peace and conflict consequences of climate change responses – or “backdraft” – panelists said awareness of the need to respond to climate change has spread but things have otherwise changed little since the initiative began in 2010. “We’re still bad at making climate change adaptation and mitigation policies that actually improve peoples’ lives in the things that actually concern them,” said Stacy VanDeveer, professor at the University of Massachusetts Boston. Not only can failure to go in with “eyes open” result in failed projects, wasted resources, and missed opportunities, it can also lead to increased tensions and conflict. The event brought together experts from the academic and practitioner communities to explore where backdraft effects are playing out and how to address gaps in program and policy development. One area of backdraft research is in extractive minerals used in the “green” economy. There is a large body of work on the impacts extractive industries can have on societies, from social, political, and economic dynamics, to environmental damage and violent conflict. Initiatives like the Kimberley Process (diamonds) and Extractive Industries Transparency Initiative (oil, gas, timber, other minerals) have been developed to increase transparency and reduce the potential for these valuable resources to contribute to violence. In research for International Alert, Janani Vivekananda found that the lack of a conflict-sensitive approach in northwest Kenya ultimately stalled a wind energy project there. “This was an initiative that needed to consult those people that used the land, and yet the consultation process – the prior informed consent process – involved elites in Nairobi rather than Turkana which was hundreds of miles away,” she said. Despite the fact that the nomadic communities in the area lacked electricity, there were no plans to share energy generated from the turbines. “The conflict risks were very evident, had they looked at this from a conflict-sensitivity perspective,” Vivekananda said. Similar challenges can be seen in the implementation of REDD+, a mechanism to encourage the preservation of forests for their carbon trapping and to reduce emissions from deforestation, which are a substantial contribution to global emissions. “REDD+ is mandated to use free, prior, and informed consent and to represent local populations in decisions, and yet it doesn’t,” said Jesse Ribot, professor and director of the Social Dimensions of Environmental Policy Program at the University of Illinois. In a 30-case, 13-country study of REDD+ and its implementation in sub-Saharan Africa, Ribot found that in almost every case, local democracy was undermined and circumvented as a result of programs being rushed. “Democracy is slow,” said Ribot, and “many of the people mandated to implement this do not have the knowledge to even be able to define local democracy in a way they can operationalize it." Governance side effects have also been observed in Laos, said Kimberly Marion Suiseeya, assistant professor at Northwestern University. With its technical monitoring, reporting, and verification requirements, the implementation of REDD+ led to a “dramatic shift away from more flexible land use approaches, where communities can rotate their crops based on their needs and climate conditions, to having fixed properties.” Not only did this undermine community-level decision-making processes, but it led to reduced adaptive capacity, eroding resilience goals. “If you understand what’s going on in a particular place and if you drill down to a very local level, what you realize is that peoples’ identities have a lot to do with decisions they make and how they view the world,” said Edward Carr, professor at Clark University. Climate models suggest that Mali, where Carr does research, will get warmer and drier as a result of climate change. A natural response might be to encourage farmers to change to crops that can withstand drier conditions. But men’s identities in that part of the world are closely tied to their ability to grow food for their families, Carr said, and the climate-friendly alternatives are sometimes cash crops rather than the traditional food stuffs. “So if you grow the crop, sell the crop, and buy food, that actually counts as being a failed farmer – you’re not able to feed your family through your own production directly.” This tension makes male farmers reluctant to change practices and could lead to unexpected social problems. Not understanding the small-scale effects of solutions calibrated to address a grand problem is a common source of backdraft, said Ken Conca, a Wilson Center fellow and professor at American University. “Often what constitutes a solution at one scale simply exports the problem to another,” Conca said. Lacking ways to perform multi-level analysis, something that looks like a cooperative solution at one level may create conflict at another, and such analysis is difficult given the many institutions responding to climate change, from the multi-lateral efforts of the United Nations, to regional and state-to-state efforts, national initiatives, cities, and on down. In the wake of the ambitious goals set by the Paris Agreement, geoengineering is one response ripe for backdraft effects at a global scale, said Conca. Climate commitments so far will not be enough to prevent warming beyond the 1.5 degree and 2.0 degree Celsius targets, raising the possibility that some actors may turn to the promised “quick fixes” of geoengineering. Poorly considered climate change adaptation and mitigation responses may carry with them the potential to exacerbate conflict, but they can also produce outcomes that promote peace and more productive use of resources, said panelists. Written by Lauren Herzer, edited by Schuyler Null. Cover Photo Credit: Salar de Uyuni salt flats in Bolivia, where lithium is mined, courtesy of flickr user psyberartist.